In-Person Speaker Sign-ups: Members of the public will be able to speak at the hearing whether or not they have signed up online in advance of the hearing. In-person speaker sign-ups will be taken beginning one-hour in advance of the hearing start time and will include individual speakers and pooled-time speakers. The county commissioners will continue to take public testimony until all speakers have had an opportunity to comment. 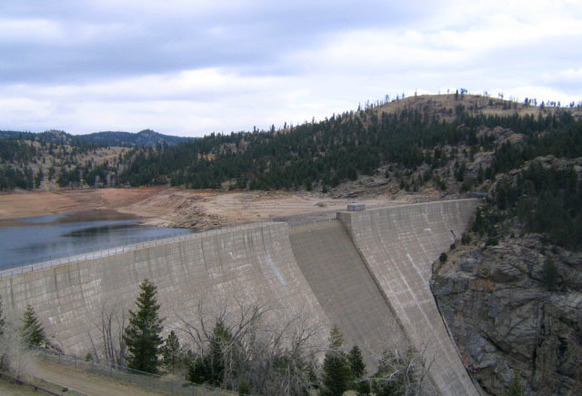 On Oct. 12, 2018, Denver Water requested that Boulder County Land Use Director Dale Case determine whether Denver Water’s proposed Gross Reservoir Expansion Project is exempt from Article 8 of the Boulder County Land Use Code, pursuant to CRS § 24-65.1-107, because the land was zoned for use as a reservoir in 1974 (prior to the State’s adoption of 1041 regulations). Director Case determined that the project is subject to review under the Land Use Code. The Director found that the statutory exemption did not apply. On Oct. 30, 2018, Denver Water submitted additional information and requested that the Director reconsider his decision. On Jan. 18, 2019, the Director Case affirmed his initial determination that the project is subject to 1041 review. Denver Water has appealed that decision to the Board of County Commissioners. The County Commissioners have set a public hearing for Thursday, March 14 at 4:30 p.m. pursuant to the Boulder County Land Use Code to consider Denver Water's appeal. Colorado law grants “1041 powers” to local governments to identify, designate, and regulate areas and activities of state interest through a local permitting process. The general intention of these powers is to allow for local governments to maintain their control over development projects even where the development project has statewide impacts. More information about the regulations passed in 1974 by the Colorado Legislature can be found here. To receive notices from Denver Water about the Gross Reservoir Expansion project, look for the “Sign Up for Email Updates” option at the bottom of the "About the Project" page on their Gross Reservoir website. Boulder County also has an email or text sign up list to receive a county-related hearing and meeting announcements concerning the proposed dam expansion project. You can unsubscribe at any time. Additional information is available on the Boulder County website at: bit.ly/GrossDamExpansion.